I completed the 12-week individual Balance program in January and I am happy to say that all is well. When I began the program, I weighed between 144 and 146 (at home, first thing in the morning) and now I weigh 128. My fasting blood sugar, which had hovered at 100 or better for some years was 93 at last check. I could not be happier with the results. Besides the physical improvements, this journey from “over fed and under nourished to well fed and well nourished” has been good for my soul! At the very beginning of the program, I had to take a hard look at some of the choices I was making and habits I had developed and that was not easy to do. However, with the structure of the program, I was not physically hungry at any time and quickly overcame cravings. The coaching support and some honest prayer really helped too. I feel like I have gained a new respect for my body and a healthy respect for, and delight in, my food. I am especially grateful to the staff for their knowledge and support through the process. Thank you for being there for me. 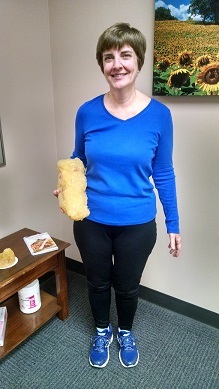 Pictured: Judy holding a model of half the weight she lost! Is the Balance program right for you? Are you interested in changing your lifestyle to improve your overall health? Are you perimenopausal or postmenopausal? Do you have an illness such as cancer, diabetes, arthritis, heart disease, high blood pressure or high cholesterol? If you answered yes to any of these questions, then Balance is a great option for you. To learn about the program, click here.